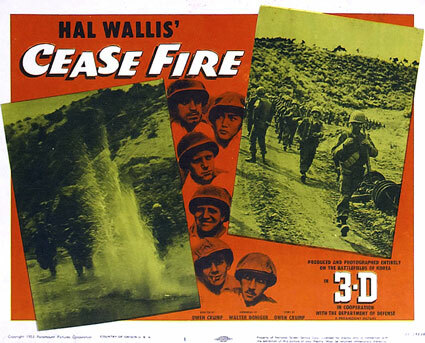 One of the most unusual (and least known) 3-D movies ever made, CEASE FIRE began as an idea by director Owen Crump, who was well-qualified to spearhead the production. In the early 1940s, Crump scripted military-themed short films for Warner Brothers, in conjunction with the U.S. Army’s Department of Public Relations. During World War II, as a colonel of the Signal Corps, he supervised production for the First Motion Picture Unit in Culver City. Later, he produced the documentary short ONE WHO CAME BACK (1951), about the air evacuation of wounded U.S. soldiers who fought in the Korean War. The film was sponsored by the Disabled American Veterans, in cooperation with the Department of Defense. Opening title card for CEASE FIRE. Crump approached producer Hal B. Wallis, an old friend from the Warner Brothers days, with his concept, which bore the working title QUIET DAY. Wallis had already produced many acclaimed films—including CASABLANCA, THE MALTESE FALCON, YANKEE DOODLE DANDY, THE ADVENTURES OF ROBIN HOOD and DARK VICTORY—and, now at Paramount Pictures, he produced SORRY, WRONG NUMBER, COME BACK, LITTLE SHEBA and several popular Martin & Lewis comedies. He loved the idea. With the cooperation of the Department of Defense, Crump and a six-man camera crew (Ellis Carter, Fritz Brosch, John Leeds, James Miller, Jack McEdward, Robert Rhea) arrived in Seoul, Korea, on May 24, 1953, and filming began on May 28, while the war was winding down (negotiations were in progress at Panmunjom). Major Raymond Harvey, a Congressional Medal of Honor winner, served as technical advisor, with Captain Gene M. Brooks as technical supervisor (“Film Project Officer”). Wallis championed the 3-D format and felt it was ideally suited for the subject. On March 14, 1953, Boxoffice reported: “Wallis declared he and his associate Joseph Hazen ‘do not regard 3-D as a passing fancy, nor do we believe that its interest relies on a so-called gimmick value.’” Crump and his crew shot footage on the front lines using the studio's Paravision 3-D camera--the first 3-D camera sent overseas. There were no special effects. All uniforms, vehicles, firearms, and even explosions were real. “Fighters one day, actors the next. That was the sudden switch of fourteen GI’s who play themselves in CEASE FIRE.”—From the press book. In the film, fourteen soldiers are sent on a reconnaissance patrol, ordered to set up an observation post on “Red Top Hill” (based on Pork Chop Hill), behind enemy lines. The real-life soldiers selected from the 7th Infantry Bayonet Division and cast as members of the fictional “Easy Patrol” were: Capt. Roy Thompson Jr. (as “Lt. Roy Thompson”), Cpl. Henry Goszkowski (“Patrol Sgt. Goszkowski”), Sgt. Richard Karl Elliott (“Elliott”), Sfc. Albert Bernard Cook (“One Ton”), Pvt. Johnnie L. Mayes (“Mayes”), Cheong Yul Bak (“Kim”), Sfc. Howard E. Strait (“Strait”), Pfc. Gilbert L. Gazaille (“Eddie a.k.a Bad News”), Pfc. Harry L. Hofelich (“Hofelich”), Cpl. Charlie W. Owen (“Owen”), Col. Harold D. English (“English”), Pfc. Edmund Joseph Pruchniewski (“Pruchniewski”), Pvt. Otis Wright (“Wright”) and Pfc. Ricardo Carrasco (“Carrasco”). The inclusion of Mayes, an African-American soldier, and Cheong, a Korean scout and translator, reflected President Truman’s “New Army” in accordance with Executive Order 9981 (issued July 26, 1948), which abolished racial discrimination in the U. S. Armed Forces. During the latter part of June, the cast and crew moved to a new location near Seoul. It was felt that a position further to the rear was more suitable to filming air strikes and related scenes. None of the soldiers received an on-screen credit, to underscore they were not professionals. Though the men generally stuck to the script, Crump allowed them the freedom to draw upon their experiences and improvise. The performances may have lacked polish yet one of them revealed star potential. Nineteen-year-old Ricardo Carrasco from El Paso, Texas, was given a pivotal role: an ill-fated private killed in action during the final hours of the war. But Carrasco didn’t care about play-acting or the perks that came with being involved in the moviemaking process. Well aware that Communist Chinese Forces were planning a counterattack on Pork Chop Hill, he was far more concerned about the soldiers under his command that he left behind. “He kept insisting he ‘had to get back up there,’” said Crump. “Every day he’d ask how long it’d be.” To Crump’s amazement and Wallis’ ire, Carrasco turned down Wallis’ offer of a studio contract. To appease Carrasco, Crump revised the script and filmed the death scene earlier than scheduled, to allow him to return to his company in time for combat. Pfc. Carrasco was killed on July 6 during the counterattack on Pork Chop Hill. Crump was deeply shaken. "If I had just made him stay—as I could have done simply by saying 'you can't go'—he'd have hated me the rest of his life." Crump said sadly, "He was determined to go. That kid was a hero. He felt a very strong moral obligation to his friends." To spare his mother, Mrs. Petra Carrasco, the pain of seeing her son perish on screen, his death scene was later reshot with a stand-in. Only a few weeks earlier, he had written a letter to his mother about his movie role. He was concerned that even a dramatized depiction of his death might upset her: “Don’t be scared when you see it, Mom, it’s just acting.” His body was shipped back to El Paso a month later, where private services were held on September 9, followed by a funeral the next day. He was buried at Ft. Bliss National Cemetery with full military honors. Grief-stricken over the loss of her son, Mrs. Carrasco passed away on March 3, 1955, at the age of forty-eight. On July 27, Crump and his crew filmed General Mark W. Clark, Commander-in-Chief of the United Nations Command in the Far East, signing the armistice in Panmunjom. After shooting wrapped on August 7, the “cast” returned to their platoon. In late August, the crew spent two days aboard the U.S.S. Lake Champlain in Yokosuka, Japan, filming scenes of F-84 Thunderjets of the 49th Fighter Bomber Wing in operation at the Fifth Air Force. For scenes depicting the close air-ground support between infantry forces and the Air Force, the camera was set up at the end of the runway, to photograph pilots rushing to their planes and F-84s speeding down the field for take-off, passing just twenty-five feet above the camera. According to Capt. Gene M. Brooks, Army film project officer, "This should lend quite an interesting—if not startling—effect. The planes appear to be coming at the audience." From August 24 to September 2, Doniger and Crump revised the script and dialogue; the Panmunjom scenes in the war correspondents tent were rewritten on September 3. It was decided to re-dub the soldiers’ dialogue using actors for the recording sessions. The fact that original voices were “looped” in post-production was never mentioned in the press, perhaps because it would have negated some of the hype around non-actors playing the roles. “The first three-dimensional picture of actual warfare, CEASE FIRE, now is being assembled into feature-length form for release in November by Paramount. Owen Crump [is] supervising the editing of some 140,000 feet of negative...Approximately 7,000 feet of film—the duplicate print used in the stereoscopic process brings the total to 14,000 feet—will go into the finished production. CEASE FIRE was in post-production when 3-D movies began to perform poorly at the boxoffice. Some mediocre films and poor projection had resulted in a rapidly growing lack of interest among moviegoers. The reasons are explained in Jack Theakston's article, "What Killed 3-D?" "The players in this picture are soldiers—actual fighting men who were in combat in the last hours of bitter conflict. Some have now returned to their homes. Others are still in service. Some were wounded or killed in action. To these soldiers and the men of the United Nations Command, this picture is respectfully dedicated." On September 25, Hal Wallis was notified that the Breen Office, which enforced the moral guidelines set by the Motion Picture Association of America Production Code Administration, would not grant their seal of approval to CEASE FIRE because the unadulterated G.I. language included “three hells and one damn.” Barney Balaban, president of Paramount Pictures, requested an appeal on October 12; on November 12, three days after a critics screening, the nine members of the MPAA’s board of directors upheld the PCA ruling. Paramount sent Crump to New York where, between November 13 and 23, he engaged in a continuous round of interviews (newspaper, magazine, radio) and television appearances to promote the upcoming premiere. Similarly engaged were nine members of the G.I. cast, who turned up on various TV shows (including those hosted by Steve Allen, Dave Garroway and Ed Sullivan) and as contestants on the radio edition of I’ve Got a Secret. For added hype, Paramount distributed records of “We Are Brothers in Arms” to radio stations. CEASE FIRE’s “Star Spangled World Premiere” in widescreen and stereophonic sound was held on November 24 at the Criterion Theatre in New York City’s Times Square. On hand were General Mark Clark, serving as host and volunteer sponsor, and the cast, in addition to military notables, United Nations representatives, the 60-piece First Army Band, Fort Dix’s crack drill team, and a large detachment of National Guard troops. Pre-screening festivities were televised by WNBT-TV, with Tex McCrary as master of ceremonies. General Clark and cast members appeared at the West Coast premiere in San Francisco at the St. Francis Theatre on December 22. Also present were Major Harvey (serving as emcee), Hal Wallis, Major General William F. Dean, the Sixth Army band, and an honor guard comprised of Korean War veterans. A “Gala Los Angeles Premiere” was held on January 12, 1954 at the Picwood Theatre in Westwood. Attendees defied wintry weather conditions (“a six-gun salute of rain, hail, thunder, lightning and an earthquake”) for the festivities, which featured a 45-piece military band from Camp Irwin, a military police drill team, and on-stage appearances by General Clark and the stars of the picture. Also in attendance were Major Harvey, Los Angeles Mayor Norris Poulson, Cecil B. DeMille, Mary Pickford, Louella Parsons, Debbie Reynolds, Terry Moore, Gene Barry, Lori Nelson, Tab Hunter, Lawrence Welk and Dimitri Tiomkin. Due to the television coverage (by KTLA) of the event, some of the invited Hollywood stars, whose studio contracts did not allow them to appear on TV in any capacity, avoided the cameras by entering the theatre through a side entrance or opted out entirely. The following day, CEASE FIRE began its regular engagements at seven L.A. theatres. It was screened in 3-D and stereophonic sound at the Picwood, Palace (downtown L.A.) and Vogue (Hollywood), and played “flat” at four drive-ins: Century (Hollywood), Gage (Bell Gardens), El Monte, and Van Nuys. For forthcoming openings, a specially-filmed introduction by General Clark (directed by Phil Pemberton) was screened to introduce the feature. Midwest premieres (in 3-D) were held on January 27 in two Kansas cities, at the Co-Ed Theatre in Manhattan and the Colonial Theatre in Junction City. Both were located near Ft. Riley; in Manhattan, civic leaders sponsored a dinner for Korean War veterans. A special 3-D screening of CEASE FIRE was held in Chicago on January 7 at the Century Theatre, drawing the “biggest turnout in years” with over a thousand civic leaders, military officials, exhibitors and media people. Yet when the film began its opening engagement on April 30 at the McVickers Theatre (on a double bill with the Bob Hope comedy CASANOVA’S BIG NIGHT), it was shown flat instead of in 3-D—an indication of the growing apathy toward the process. Nevertheless, it didn’t diffuse the enthusiasm of Mae Tinde of the Chicago Daily Tribune, who raved: “Seldom have I seen an audience so raptly attentive as the group present at the preview of this film of a part of the Korea story, photographed in the blood streaked ‘Land of the Morning Calm.’ The viewers were predominantly army men, the majority with battle stripes, and their reception, at least during the first half of the picture, seemed a guarantee of its validity of approach, as well as background. "A couple of privates, obviously familiar with the streets in the towns and the rocky crags of the mountain country in which the battle scenes took place, made only nervous comments such as, ‘They’re bunching up’...or ‘Stay down, you knuckle head,’ as a patrol moved up on reconnaissance...the film is tensely realistic, revealing the awful anonymity of the helmeted men who were dots on the map as they probed into fluid enemy lines. On February 12, CEASE FIRE opened in 3-D at the Plaza Theatre on Piccadilly Circus in London. The flat version went into wide release throughout London beginning March 8. The supporting feature (also shown flat) was the Paramount 3-D feature, JIVARO, retitled LOST TREASURE OF THE AMAZON for UK release. In late March, CEASE FIRE finally had its Korean premiere, for the 7th Infantry. All of the combat veterans who were still with the division said the film looked “too much like Korea,” attesting to its authenticity. In mid-October 1953, Paramount had been the first studio to offer exhibitors the option of booking their new 3-D releases in flat versions. By early 1954, many exhibitors opted to play CEASE FIRE (and other 3-D titles) mostly flat. Few moviegoers had the opportunity to see the film the way it was intended to be seen. Despite an initial string of successful 3-D engagements in major cities, CEASE FIRE did not perform to its full potential at the box office. Historian John McElwee confirms that it received 452 bookings in 3-D (a total of $264,000 in domestic rentals) and 11,570 flat bookings ($571,000 in domestic rentals). Those figures reveal 46% of the total domestic rentals came from 3-D bookings which comprised a small fraction of the playdates. If more theatres had played CEASE FIRE in 3-D, it would have possibly done much better at the boxoffice. There were certainly enough potential venues. In January 1954, International Projectionist reported that “some 5,000 theatres in the nation have been equipped for 3-D.” In a related article, also from January 1954, Motion Picture Daily quoted J. Harold Booth, executive vice-president of the Polaroid Corp., asserting that 3-D had “finally found a secure place as a medium to enhance entertainment values” and citing a Wall Street Journal estimate that the rise in better pictures and better projection gave 3-D productions a boxoffice advantage of at least 15% or more, with many 3-D engagements running as much as 60% ahead of conventional film showings. After theatrical bookings ended in 1954, CEASE FIRE disappeared and remained hidden in the vaults for more than forty years. We can find no trace of any domestic television broadcasts until June 6, 1998 when it began running on the popular cable channel, American Movie Classics. In September 2006, a new 35mm print was struck for the World 3-D Film Expo, presented by SabuCat Productions at the Egyptian Theater in Hollywood. This timely and important motion picture deserves to be widely seen again and you will soon have that opportunity. The 3-D Film Archive is restoring CEASE FIRE in 3-D, widescreen and stereophonic sound from original 35mm elements for release on 3-D Blu-ray by Kino Lorber Studio Classics on November 21, 2017. Most 3-D movies of the era used the format to accentuate and exaggerate artifice. CEASE FIRE is the rare production to employ the stereoscopic process to heighten reality, emphasizing the brutality of combat, the vastness of a cold, unfamiliar terrain and the isolation felt by a patrol of valiant fighting men. Part-documentary, part-drama, part-cinéma vérité, the film remains a unique and remarkable achievement. Original 1953 radio spot promo for CEASE FIRE. To read original articles about Pfc. Ricardo Carrasco, American Cinematographer and Pacific Stars & Stripes on filming in Korea, the New York/Los Angeles premieres and the censor issue, click here. Special thanks to Andrea Kalas and Laura Thornburg at Paramount Pictures, Joe Rubin and Ryan Emerson at OCN Digital, Frank Tarzi and Bret Wood at Kino Lorber Studio Classics, Mike Ballew, Dr. John Bishop, Eckhard Büttner, John Geary, Hillary Hess, Greg Kintz, Dr. Robert Kiss, Thad Komorowski, John McElwee/Greenbriar Picture Shows, Jack Theakston and Tom Weaver.